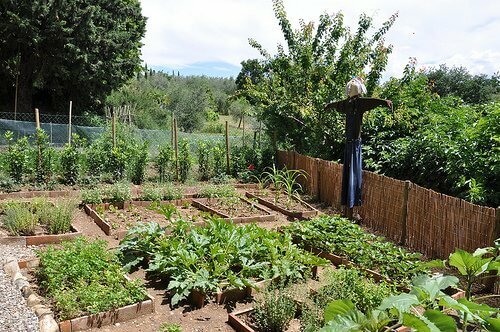 Growing your own organic vegetables is a great way to provide your family with nourishing and frugal food. Last summer was my first real attempt at growing our own food in a garden. Although it did not go nearly the way that I envisioned, I learned some important lessons that I am excited to put into practice this year. I know many of you reading are seasoned gardeners, much more knowledgeable than I am, but if you are a garden newbie, like I was (actually still am) I hope to give you some encouragement and a few pointers to help you as you set out on your gardening journey this year. 1. Pick a few types of vegetables and plants lots of them. I wanted to start off with a simple garden last year, I didn’t want to overwhelm myself with gardening on my first attempt. And while I only planted 6 types of vegetables, I didn’t plant nearly enough of them to actually get the kind of yield I was looking for. For example, my family loves sugar snap peas, so I planted about 20 plants, but the most peas that I harvested at one time was only nine. Usually it was more like only four or five, and while I loved eating them right off the vine, I never had enough to actually use for a meal. I think that as long as you keep the number of different types of vegetables lower, you can plants lots and lots of the same ones because they won’t require different care or a lot of extra effort. If they are veggies that you love and know you’ll use, you may as well plant enough to have lots to eat and maybe even some left over for preserving. While I realize that I didn’t plant nearly enough plants to feed my family, my other mistake was actually that I over planted the garden boxes that I had. Granted, the boxes were small – about 2 ft. by 4 ft., because hubs didn’t want the garden taking over the yard, and neither of us realized how much room the plants would actually need. I wanted to maximize my space, but I planted too many plants in one box and some of them ended up getting shaded out by the bigger plants (which may have also affected my yield). This year we are expanding our garden to a much larger area in our front yard which is southern facing, and I am going to make sure I pay attention to the spacing of the plants given on the seed packets! 3. Set a watering schedule, and stick to it. I’m planning to use soaker hoses for much of my garden because they are supposed to be the best for getting water down to the roots, which is where the plants really need it, without wasting much water. I’m hoping to be able to hook the soaker hose up to our rain barrel so that we can use the rain water we’ve collected to water the garden. 4. Plant in the spring and again in the fall. I didn’t realize that some of the vegetables I was growing, like snap peas, lettuce, and spinach can be planted and harvested again in the fall, extending your gardening season. I’m planning to plant for the fall around mid-August to early September, no later than Labor Day. Especially if you have seeds left over from your spring planting, it really doesn’t take much extra effort to plant again in the fall, and you get to enjoy a second crop of the vegetables that your family loves. We have a lot of rabbits in our neighborhood, I think there is even a family of them that live under our deck. I definitely underestimated the effect that little critters can have on your garden! This year I will be prepared by putting up chicken wire fences around my plants that rabbits like to nibble, like lettuce, spinach, peas and carrots. It’s so sad to go out to your garden and find that something other than your family has been enjoying the fruits of your labor! 6. Keep a garden journal. A good friend gave me this advice last year, and I didn’t follow it as closely as I should have. I did write some things down about my garden at the beginning, but then I got lazy and didn’t write much for the rest of the season – which is when stuff is really happening that is important to take note of. Write down when you planted, what you planted, how many you planted. Write down when your seedlings sprouted, how long it took for them to produce, how much you harvested, how long they produced for, and if you had any problems or issues. All of this will be valuable information as you plan your garden for the next growing season, so you can plant in succession, and plant enough so that you will get the kind of yield you are looking for. 7. Now is the time to start thinking about your garden! Last year I didn’t realize how quickly the spring would creep up on me, even though I was waiting for it and felt like it would never come! I didn’t know that if you want to start plants indoors, most of them can be started by mid- to late February, so really, now is the time to decide what vegetables you want to grow, get your seeds, and get started! I just found this great tutorial for using toilet paper rolls for seed starters, as well as this handy chart for when you should start your seeds inside, based on your last frost date. I need to get started! If you are new to gardening I really encourage you to jump in and go for it this summer! You will have fun, and learn a lot! It is such a great feeling to serve your family food that you just picked right out of your own yard! What lessons have you learned in gardening that you will put into practice this growing season? Have you started planning your garden yet? Hey there, I love this article, I am also a newbie gardener! This will be my 3rd year and I still feel completely untrained, haha. It’s totally trial & error for me but Im having a great time trying! 🙂 Thanks for the tips and pictures, I love it. Im doing raised beds in tractor tires this year (3rd move around the yard) and I think this will work out really good. I hope. I had the same experience with the peas my first year, too, Lol! Thanks again I love it! Thanks for the tips! This is our first spring in our house, and I am just starting to plan our the garden. Exciting! Emily- Great advice! I also highly recommend books for the box gardening. This will be my 4th year to garden and I have gained so much knowledge from a book by Mel Bartholomew. I am really excited to start this year! Thanks for the kick to start my garden planning. Its hard to get my head wrapped around it with all the snow out my window. I love Mel’s book on square foot gardening, too! I’ve had the best results when I really follow his plant/square foot guidelines (I tend to plant too much per box because I can’t bear to kill any seedlings I worked so hard for!). Also, do an online search for making seed pots out of newspaper … I’m trying that this year for the first time and it seems to be working really well! Great tips! Yes, very much agree with the “don’t overplant” one- we waaay overdid the squash last year, and we are still eating on them! Planning on definitely scaling back on those for 2011! Thank you so much for all your tips. I’m usually the person that tries to do EVERYTHING in one swoop, so I really appreciate your tips. This year, my goal is to keep is simple. I love the idea of a garden journal, too! I love journals for the very reason of seeing what works and what doesn’t, so it naturally makes sense to do this for the garden. http://www.tuliptime.webs.com/ this is my website I set up to help me remember what I had done in my garden that worked and what didn’t. Great advise you gave. Thank you! We live in Southern Ontario and there are lots of pictures on my website if you are interested. One quick tip – when you mentioned that planting 20 pea plants didn’t produce the yield you wanted – try succession planting. This is good for salad greens as well. This is where you plant a few rows of seed, wait a week, then plant another row, then another row and they will ripen at different intervals. I’m surfing around today trying to get motivated to plan my next garden, and your post helped! Last year was my first year gardening, too, and I had similar issues with crowding, a few snap peas at a time, and not sticking to a watering routine. Here’s to better success this year. I just wanted to add that chicken wire alone will not be sufficient to keep bunnies at bay. They chew right through it! We use Hardware Cloth, which is a heavier gauge wire and much smaller squares. It is shorter, though. We simply add a layer of the hardware cloth along the ground over our existing wire fence. It’s working fairly well, so far. @Mrs. Graham Gardens @ grahamgardens.com, Thanks so much for this advice – we definitely want to make sure that our fence actually keeps the critters out! Deep in planning, ordering/buying seeds and just bought a ‘greenhouse in a box’ which will assist in early seed starts. A man in our county sets plastic milk jugs, filled with water, amongst his plants. They heat up during the day, releasing the heat at night and he’s able to push his growing season. Another family uses sheets of black plastic to keep down weeds. I’m not as comfortable, perhaps I’m paranoid, but I don’t like black plastic being that close to my garden plants. The biggest thing I’m doing new this year…sharing my greenhouse, seeds, garden and produce with a neighbor in exchange for his help. He’s got a tiller and will do the heavy lifting…great! This is so perfect–I just started onion seeds today. I’m super excited about trying to grow onions from seed. And I’m definitely going to have to try that toilet paper roll seed starting idea. I’ve been using cardboard boxes lined with garbage bags for my onions, but for plants with spreading root systems it wouldn’t work well. Hey gals! Here is a great resource for any newbie …. If you go to the farmers almanac website you can get planting dates for your zip code. They also break down the day of the month to help you stay on track and keep organized with your endeavors. It’s an old school publication so they have lots of info on natural living and frugality. I visit the site every day! We do quite a bit of back yard agriculture and I would be lost without it! @Sarah, Yes, I agree! I love using the farmer’s almanac site! It’s best to use such FA tools sparingly and knowing the vagaries of your own garden spot. Our zip code includes several different micro-climes; for example, our zip code, according to the FA and USDA whose map the FA uses, says our zone is 6A, -5 to -10 but the temp here in the Cove has been -35F; lower temps are recorded as the coldest recorded temp in the County. It’s not frequent but it’s best to know it can happen and be as prepared as one can be. In town, just 20 miles away, the zone is, generally, 6B and in Burkes Garden, it can be even colder. @Sandra, I think that’s good advice, to really get to know your micro-climate. Even with using those tools, I still end up playing my planting by ear, as I watch and see whether the given dates will really work or not, and I trust my gut as to whether I can it’s really warm enough to go through with it. I do think they Farmer’s Almanac tools are a great general guideline, though, especially for those who are newer to gardening. Another thing that I’d heard works to keep rabbits away from your garden, is to spread hair clippings on the ground around your vegetables. The human scent will deter them. Plus, it is a form of nitrogen for your plants. Better pea yields… And I was going to recommend the book “Square Foot Gardening” by Mel Bartholomew, as it seemed that’s the results you were looking for. But it looks like others were faster than I and already recommended it. Best wishes for 2011. I would also add – have your soil tested by your local agriculture extension service. Most have kits for a small fee, where you collect and send in soil samples and they will tell you what nutients your soil is lacking. This helped my garden yields tremendously! Great post! I’m homeschooling for the first time this year and want to do a very small garden with my girls this summer. We’ll be done with our school year but I think it will be a great science project for them throughout the summer. I want them to keep a gardening “journal” themselves. They’re in Kinder and preschool so it will be lots of drawings :o) I’m only planning on planting cucumbers and strawberries. I wanted to do one veggie we eat a lot of and one fruit we love. I know nothing of planting them so I have to do a lot of research. I don’t even know if this is the time for them! I’m a 2nd year gardner and just discovered this free Garden Journal from Terrior Seeds; they also have a great eNewsletter that was very well done and informative. I’m doing all heirloom varieties this year and hope to harvest the seeds…definitely find out from a seasoned veteran what varieties work for your area! Well…never had a garden before, but thinking of trying. We love fruits and veggies, and it would be so convenient (not to mention healthy) to grow our own. My biggest worry is time…how do you do it all??!? Does it take a big chunk of time out of your day? Obviously, we’d start out small, but I’d really love to eventually have a good size garden, I just wonder how you do all do it? How do you balance “homekeeping” and gardening? As a newbie myself this year I wanted to thank you for the article, and all the great replies… but also wanted to point out to Emily and the readers is the probable reason the peas didn’t do well is lack of pollinators – bees, butterflies, hummingbirds and other flying insects which can help pollen transfer. I’ve seen as my plants start to show flowers that I really have no pollinators around, so, I look at the plants to determine male and female flowers – the females should have the beginnings of the fruit/ vegetable near the flower – then pluck off a male flower and physically take it around to other flowers, touching them together to achieve pollination. This is why the bees dying off is such a big deal…even bats are pollinators and they’re dying from fungal diseases. If you have the time and space I’d look into becoming a beekeeper as well, then you have your pollinators right in your yard. Be sure to check local ordinances to see if it’s legal in your area. Then look for local beekeeper associations. My husband and I intend to do this but the funds are not there this year. Hopefully our garden this year will save us enough money on produce we can do it next year. If not, we will at least add some pollinator – attracting flowers next year to draw them to the garden. For rabbits & critters – if you have a dog and live in an area were it is bearable for it to be outside at night, leave it out. No critters will go after your garden. be sure the dog knows his boundaries so dog doesn’t ruin your garden. I will be leaving my 2 out. They listen well and it only took a few times correcting them to not go in the garden. “Companion planting” – this means planting parsley in w/ your tomatoes so the insects which would normally eat your tomatoes go for the parsely instead. This is just one example off the top of my head. Google it to find more. I do remember strawberries are also a good companion since they attract many pests away from your other plants. We planted lots of strawberries and parsely in w/ our garden. They look like they’ve been in boxing matches, but are doing the job – the other plants look great. This is natural way to get around using pesticides, too. If you have a plot in your yard instead of planters, did you buy seeds for a “bumper crop” after the growing season? 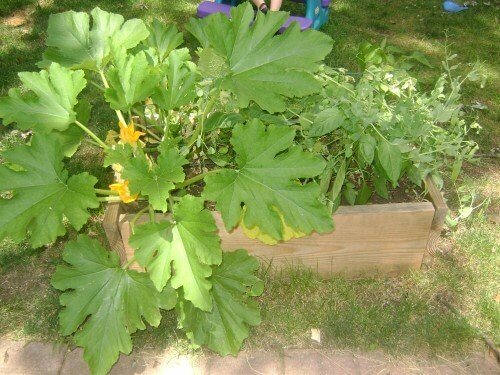 A bumper crop returns nutriernts to your soil during the fall/winter months. We’re looking into various grains as bumper crops, since we are ambitious and wondering if we can use the grain somehow. Clover was highly recommended since it gives back nitrogen(?) to the dirt. Ok, newbies, class dismissed! Now get out there and get dirty!! This was such a huge help to me. I’m a first time gardener and didn’t know where to start.